The biggest prize of this free agency, Kevin Durant, has his six meetings set up. Everyone wants to have a shot at signing him, but only the Oklahoma City Thunder, Boston Celtics, Golden State Warriors, San Antonio Spurs, Miami Heat and the Los Angeles Clippers have a shot at signing him. Durant initially put the Thunder, his current team, Warriors and Spurs as the first team on his meeting schedule, but has now added the Celtics, Heat and Clippers, who seem like a surprising addition, never being mentioned during the season as one of the contenders to sign him. Both the New York Knicks and Los Angeles Lakers would have loved to have a shot at signing Durant, but it doesn’t seem he has any interest in growing with a team in disarray. The Washington Wizards, his hometown team, missing the playoffs in 2016, are also out of the picture. Durant, like most free agents, says it’s not about the money, but a whole array of factors. But if money plays a part, obviously staying in Oklahoma City is better. He can sign for $163.8 million over five years with the Thunder compared to $120.6 million over four years with everyone else, but that’s if he takes the 2016 five-year deal. 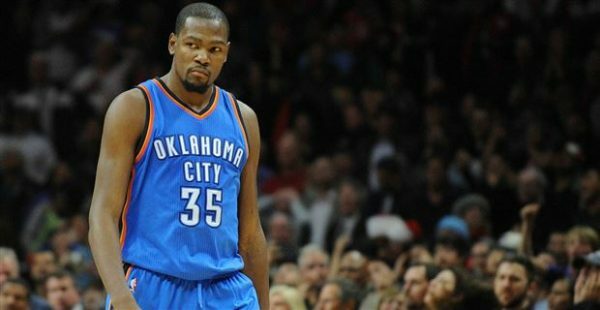 Durant can sign a one year deal worth $28.2 million and sign a five or four year deal in 2017. 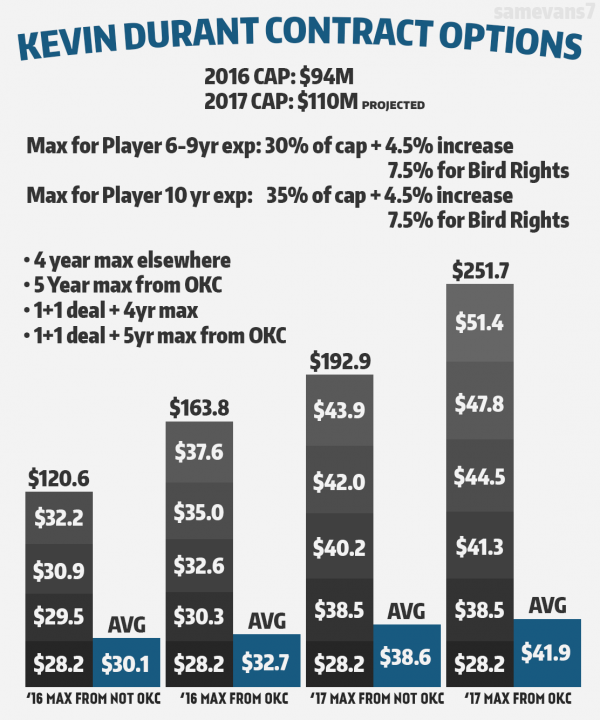 The salary cap jumps from $94 million to $110 million, and he becomes a 10-year veteran, which means he can get 35% of the cap and not “just” 30%, raising his earning capabilities to $251.7 million over five years in Oklahoma City, or $192.9 million on other teams. So what’s the scoop on each team?